Since 2002, the Center has annually convened thought leaders in the fields of craft, creativity, design, and associated disciplines to discuss, share knowledge, and make recommendations on relevant topics and areas to the field of craft. The meeting is a way to keep our finger on the pulse of intellectual thought and trends and identify education-oriented needs within the field. Participants have included museum directors, curators, university faculty, scholars, editors, critics and artists with diverse media expertise. The Craft Think Tank has frequently resulted in recommendations for new Center for Craft Core Programs and Projects, including the Craft Research Fund, Windgate Museum Internship. Makers: A History of American Studio Craft, and the New Apprenticeship Project. The first session explored the landscape of craft makerspaces. It mapped the many factors that could influence craft makerspace initiatives, from types of users, to policy and tools. In the second session, participants speculated about the emerging issues which, in the future, are likely to impact the success of craft makerspaces. Finally, participants used this content and their expertise to build hypothetical models of what a future craft makerspace could be. Marilyn Zapf, Assistant Director, Programs and Curator, Center for Craft Participants Attendees included experts in the fields of craft and makerspaces. The Craft Think Tank further benefited from contributions from Liz Corbyn, PhD Student in Material Culture, University College London, Dee Halligan, Director, From Now On, and Justin Marshall, Associate Professor of Design, Northumbria School of Design, UK. This Craft Think Tank and publication was made possible, in part, by the University of North Carolina Asheville and the Andrew W. Mellon Foundation. On June 19-21, 2016 the Center for Craft, in partnership with Warren Wilson College, convened a two-day, special-topic Craft Think Tank, bringing together a select group of experts across disciplines to assess the state of craft in academia. During the first day, the group met to consider, adopt, or reject new strategies to further the study (and thereby the practice) of craft. The second day focused on developing a master’s-level program in critical and historical craft studies. The group discussed and made recommendations concerning the content, format, approach, audience, and resources needed to create a relevant and successful program. Center for Craft and WWC’s 2016 Craft Think Tank was supported, in part, by a grant from the John & Robyn Horn Foundation. The Center for Craft held its 12th Craft Think Tank on October 16-18, 2014 in Asheville, North Carolina. This year’s intimate gathering posed an opportunity to focus on the specific needs of the curatorial community, bringing together a select group of national and international, emerging and experienced curators, artists, and critics. Conversations focused on questions such as: what are the obstacles and opportunities for exhibiting objects and making in the 21st Century, what does it mean to be a “craft” curator in a post-disciplinary creative landscape, and how can we strengthen the display, documentation, and preservation of objects? Participants also considered how matters like diversity, technology, and interdisciplinary inform the future of craft curating. Nora Atkinson, Lloyd Herman Curator of Craft, Renwick Gallery, Smithsonian American Art Museum, Washington D.C. In 2013 the Center for Craft partnered with the American Craft Council and Crafthaus to discuss the brand of craft. The meeting was held October 17 – 19, 2013 at the Montreat Conference Center in Black Mountain, North Carolina and was facilitated by the brand consulting agency, Fenton. 25 participants were in attendance. The 2012 Craft Think Tank brought together 17 thought leaders for three days to discuss the need to develop new models of craft apprenticeships. Topics of discussion included the history of apprenticeships, the state of craft education, modes of work, mentorship and influence, transmission of knowledge, equity and legal concerns, and steps to move towards a new, sustainable model.The New Apprenticeship Project website is a repository for the future development of this project. Steven T. Aceto, Attorney, Aceto Law Office P.A. Tony Clarke, Partner, VCA Inc. 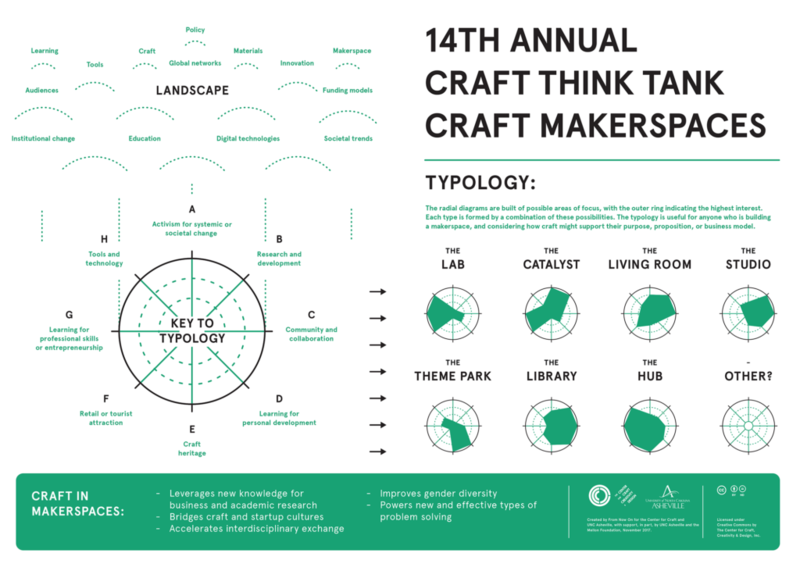 The 2011 Craft Think Tank convened 15 thought leaders in the field of craft to discuss a variety of topics suggested by participants. This year’s discussions addressed how craft is defined in the university setting, the role of the artist outside of the studio, the anticipated impact of craft in 10 years, and how national and regional craft conversations inform one another. The 2009 Craft Think Tank convened 19 though leaders in the field of craft to discuss a variety of topics suggested by participants. This year’s discussions addressed the effect of the internet on craft artist-gallery relationships, federal funding opportunities for craft, the impact of CAD (Computer Aided Design) on craft education, practice-based PhDs in craft, the opportunity of craft collaborations in a global economy, ‘borrowing’ from the fine arts, and advancing the goal of having the history of craft courses taught at the undergraduate level. The 2008 North Carolina Craft Think-Tank marked the seventh year the Center for Craft convened leaders in the field of craft. Topics were introduced by participants then opened to the full group for discussion. The 2008 session major points were recorded by then Center for Craft director Dian Magie and assistant director Katie Lee and outlined in the report below. SESSION 1: How is the World Wide Web connecting the maker with the market? How can professional makers become better educated in alternative methods of marketing their work? How can universities prepare their craft/design students who plan craft as an entrepreneurial business? SESSION 2: Increasingly museums are being gifted with major collections and endowments relating to contemporary craft/decorative arts. What curatorial challenges do craft collections present within the institutions? How can craft exhibitions enhance audience development and the educational mission of the museum? There is a lack of serious press coverage for craft related museum exhibitions– how can this be addressed? SESSION 3. Friday afternoon sessions related to academia, through several topics. - SESSION 3-A What changes in program or degree requirements would be most helpful for graduating BFA craft students to prepare them to enter the field professionally? How important is it for the maker to study the history of craft? - SESSION 3-B As a museum intern, what were the most valuable educational skills that helped in your internship, and what areas could be strengthened in preparation for working with craft in museum collections and exhibitions? How important is it for a curator to experience making? - SESSION 3-C What are the pros and cons of establishing a Ph.D. as the “terminal degree” for studio craft faculty? - SESSION 3-D How can craft research and scholarship be encouraged at the MA and Ph.D level? Discussion on RFP for university to sponsor a seminar with peer-reviewed papers read. SESSION 4: What is the status of public and private foundation support for studio craft in the U.S. compared to Australia, Canada, England, Europe? In what ways could the support in the U.S. be encouraged and increased? SESSION 5: What are the tensions and opportunities of digital technology, new materials, and multiples for makers of studio craft? SESSION 6: The language and relationship of craft to design and “fine” art is internationally debated. 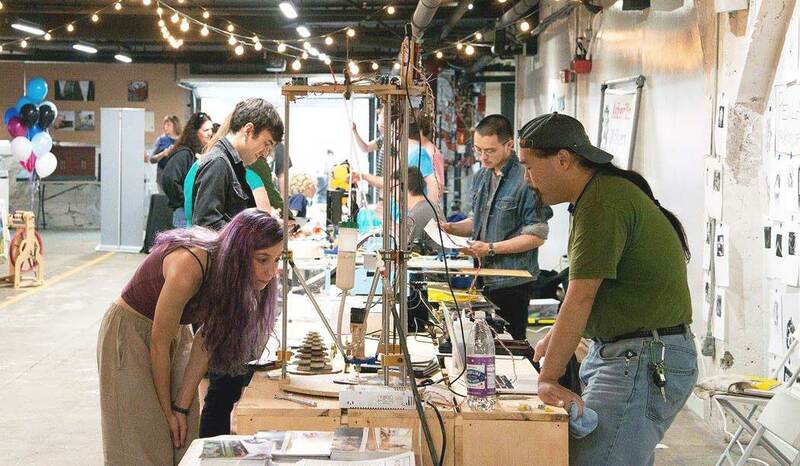 How does the inter-relationship differ for universities, museums, and makers? SESSION 7: How can we find commonality or shared values between the disparate populations and practices that now fall under the craft/design banner, and what criteria can be used to navigate the shifting landscape as old boundaries erode? Rob Pulleyn, clay artist; developer Marshall School Artists Studios; publisher Lark Books 1979- 2005; CCCD nonprofit/foundation board member. On April 12-15, 2007 the Center for Craft (formerly the UNC Center for Craft, Creativity and Design) convened twenty-two leaders in the field of craft – artists, curators, faculty, writers from throughout the U.S. with representatives from Canada and England, including Center for Craft Director, Assistant Director and three Center for Craft board members. Friday and Saturday attendees participated in discussions on seven topics, each with three discussion leaders from the group. Lively discussions continued at meals, and as the group assembled at the end of the day for wine and cheese on the veranda of Waverly Inn, one of two inns reserved for retreat participants. SESSION 1: What education is necessary for the 21st Century studio artist to achieve economic success and/or artist growth and where can it be found. SESSION 2: How can we attract and train 21st Century craft curators? SESSION 3: What is the future of the handmade, limited production, and/or mass production in studio craft? What is the impact of technology on makers? SESSION 5: How is the intersection of craft and design shaping academia and the marketplace? SESSION 6: Who is the audience for craft in the future and how will we reach that audience? SESSION 7: What are some shared issues for craft in the U.S., Canada and England? What are some significant differences? SESSION 8: Recommendations to CCCD for future of the “Think-Tank.” Topics, size of group, changes in structure. Other recommendations. The Center for Craft (formerly the Center for Craft, Creativity and Design) began hosting a two-day spring retreat in 2002 with the charge to “identify and prioritize initiatives that will advance craft in academia and the curatorial worlds.” In the following three years, the topic of the retreats further developed the initiatives recommended in 2002. Participants in the retreats represented leaders in the field of fine craft – museum directors and curators, university faculty, scholars, editors, critics and artist – with diverse media expertise and geography. Thirty-one craft leaders gave of their time to participate in one or more retreats. Addendum A is a list of all participants. This report consists of abstracts of the four retreats. Participants in this two-day retreat followed the recommendation from the March 2003 retreat to replace the goal of creating a scholarly peer-reviewed journal, with a peer reviewed grant program for craft research. the 12 participants formulated the process for a Craft Research Fund. In may 2004, the Center for Craft (formerly the Center for Craft, Creativity & Design) received support from a foundation, to follow these guidelines, offering up to $100,000 a year for three years in a pilot program. Prior to the Chicago 2003 SOFA exhibition, a group of craft leaders met to discuss the creation of an inventory of craft in museum collections. This was a component of one of four initiatives identified during the 2002 North Carolina Summit Retreat on Craft charged with identifying initiatives that will advance craft in academia and the curatorial worlds. The two-day retreat on craft publications was convened to discuss and develop specific recommendations for research and publications on craft that were identified as priorities in the March 2002 Summit Retreat on Craft. Four of the ten participants participated in the 2002 retreat. Before arriving, participants reviewed the initiatives recommended and responding comments from the field published in the North Carolina Summit Retreat on Craft. The meeting was held in UNC Asheville Kellogg Conference Center in Hendersonville North Carolina and sponsored by the Center for Craft formerly The Center for Craft, Creativity and Design, a regional center of the University of North Carolina) located adjacent to the Conference Center. Center for Craft Executive Director Dian Magie facilitated the meeting. 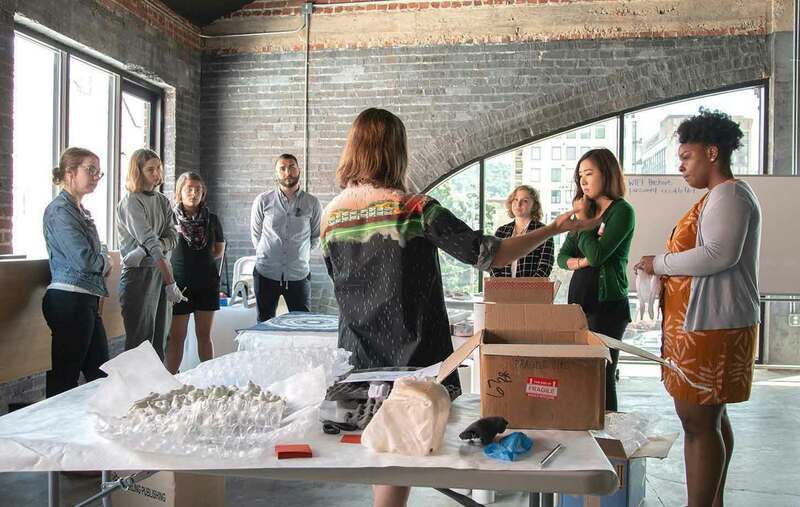 The Center for Craft (formerly the Center for Craft, Creativity and Design) hosted a two-day retreat for 13 national leaders in the field of craft, who met to identify initiatives that would advance craft in academia and the curatorial world. A White Paper (executive summary) was then circulated to more than 80 craft leaders across the country for additional comment. The editing and publishing of the full Proceedings of the Retreat, supported with a grant from the American Craft Council, took place in the 2002 summer. Through a facilitated process, the retreat participants built on their collective experiences to identify a unifying issue that shaped the conversation: How to place craft in a larger cultural context. With a focus on this theme, the group prioritized academia, museums and creators/makers as the top three target audiences. Through a facilitated process, the retreat participants built on their collective experiences to identify a unifying issue that shaped the conversation: How to place craft in a larger cultural context. With a focus on this theme, the group prioritized academia, museums, and creators/makers as the top three target audiences. The conversation then shifted to focus on initiatives for future action. The group was asked to think of as many tactics as possible and as the discussion continued, there became a clear sense of the interwoven nature of these target audiences. Participants began looking at the intersections that joined these groups and found that there were four main initiatives that would have the greatest impact on the field: 1) a book on the history of craft; 2) a scholarly journal; 3) a university craft studies program with an endowed chair; and 4) placement of craft within museum collections. ‍Title: The American Studio Craft Movement. The idea for this survey text is overwhelmingly considered the most important charge. Some of the specifics are as follows: a) include a brief historical section on precursors to the Studio Craft movement; b) organize the book chronologically; c) emphasize movements and topical issues; d) follow major historical benchmarks; e) include education and support group chapters; f) avoid separating material by media; g) strive for diversity in the artists discussed. The author should be one editor who works with a number of writers and has the authority to re-write all text to present a unifying voice. Another approach would be a single author who can analyze and keep content fresh. The audience would include those in cultural studies, art history, studio work, American studies, makers not enrolled in university programs, collectors, dealers, museums and libraries. ‍A scholarly bi-annual Craft Studies: History and Criticism is needed that will have an interdisciplinary approach that focuses on the aesthetic, and includes technical analysis only as it applies to the aesthetic. Standard features include: a) a critical book review; b) critical exhibition reviews; c) well-researched scholarly articles with footnotes; d) craft criticism; e) technical information as part of a larger context; f) interviews to capture verbal history of leaders/makers in craft field; and g) craft as a subject from the interdisciplinary approach. This journal is without restriction to media, cultural environment, historical era or geographical region. The primary focus, however, is North America.Recommend an editorial board with a paid managing editor. Authors should be compensated for their contributions. This could be an interdisciplinary program leading to a degree, or alternately, a concentration within an existing degree program. This type of program will be placed in a university that a) demonstrates existing support for programs that are interdisciplinary; b) has a museum on campus or in the community for research; c) has an appropriate library; and d) has a supportive community of craft artists. A director will be named as an endowed chair placed in a department (most likely an art history department). This position will entail both the administrative and professorial aspects of running the program. The chair should have knowledge or experience in studio craft (e.g. MFA) and/or have a Ph.D. in American studies or art history. Museums need to be surveyed to track the expansion and contraction of the field, the percentage of exhibits relating to fine craft over a five-year period, and focus of museums, including the opening of new “craft” museums. A survey and database with images of work in collections would assist in the study of craft and exhibits co-sponsored by several museums. A fund should be established for museums to acquire craft objects for their permanent collections. Grants are needed for educational programs and also a source that could subsidize participation fees for traveling craft exhibits. The acquisition assistance should be open to all museums, while the education and traveling exhibitions monies should target general museums who do not specialize in craft. Additional strategies that support craft in museum collections involve acquisition support, traveling exhibition support and educational department support. Glenn Adamson, Curator, Chipstone Foundation, Milwaukee Art Museum, Wis.
Joan Falconer Byrd, author, Professor of Art, Western Carolina University, N.C.
Diane Douglas, Executive Director, Center for Liberal Arts, Bellevue Community College, Wash.
Mary F. Douglas, Curator of Collections, Southern Highlands Craft Guild, Asheville, N.C.
Robert Ebendorf, Belk Distinguished Professor in Metal, East Carolina University, N.C.
Martha Drexler Lynn, author/curator, 19th- and 20th century production and studio craft, Carmel, Calif.
Bruce Pepich, Director, Wustum Museum of Art, Racine, Wis.
James Tanner, Professor of Art, Minnesota State University in Mankato, Minn.
Kenneth Trapp, Curator-in-Charge, Renwick Gallery, Smithsonian Museum, Washington, D.C.
Consuelo Jimenez Underwood, fiber artist, Professor of Art, San Jose State University, Calif.
Howard Risatti, Chair, Department of Crafts, Virginia Commonwealth University, Va.